Protects your outboard motor, propeller and skeg. Don’t pay for unnecessary repairs to your outboard motor, propeller or skeg. Let’s face it, our lakes and oceans can get shallow really fast. Not to mention the always-annoying debris. A small investment can save you money, time, and frustration. Spend more time on the water and less in dry dock. Don’t be surprised if your fellow boater drops by and asks a bunch of questions. I recommend you grab 2 beverages and tell them all about it. Who knows, this could be the start of a great friendship. Designed for the ‘Serious Boater’. -Keeps fishing lines and downrigger wires away from the propeller. 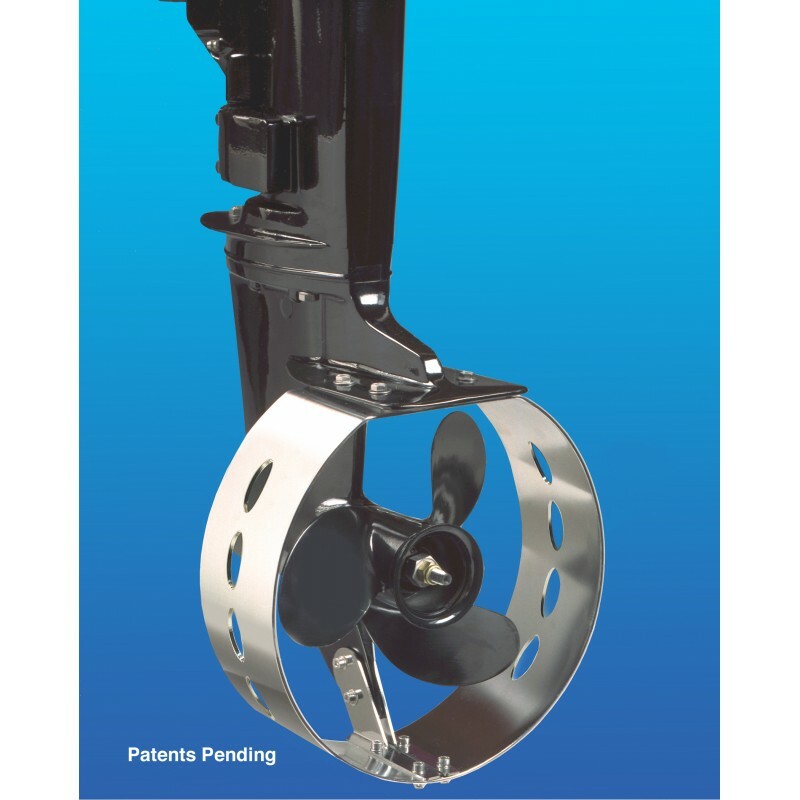 -Increases the efficiency by keeping more “solid water” around the propeller. Provides better steering while running at slow speeds. Acts as a rudder when in reverse. Tighter turning radius and less side slip. Patented design includes “pressure release ports”, designed to enhance the guards performance. Helps protect motor by deflecting debris in the water. Helps to protect the propeller from damage. Helps to protect the skeg from damage. All required mounting hardware is included. -Stainless steel screws, washers and nylon locking nuts, & instructions. Not intended for human protection. Heavy duty stainless steel 10 & 11 gauge. Check with your insurance company, an Adventure Marine Propeller Line Guard may qualify for an insurance premium reduction! To choose the correct model, you MUST measure from under anti-cavitation plate to the bottom of the skeg, as shown by ‘Dimension A’ below. To select guard size by propeller diameter only is NOT recommended. 17", 16", 15", 14", 13", 12", 11", 10", 9"
Very well built, fit and finish is excellent its a top notch product. Customer service was very good and got back to me very quickly to answer questions about the prop guard. I would recommend this product and company. I bought a prop line protector guard from you in November 2018 and I like to say it was well worth the money. Hi Dean, thank you very much for this great review! We are of course very happy it saved you from a costly boat repair. Not to mention the possibility of losing your primary drive in a moving river.